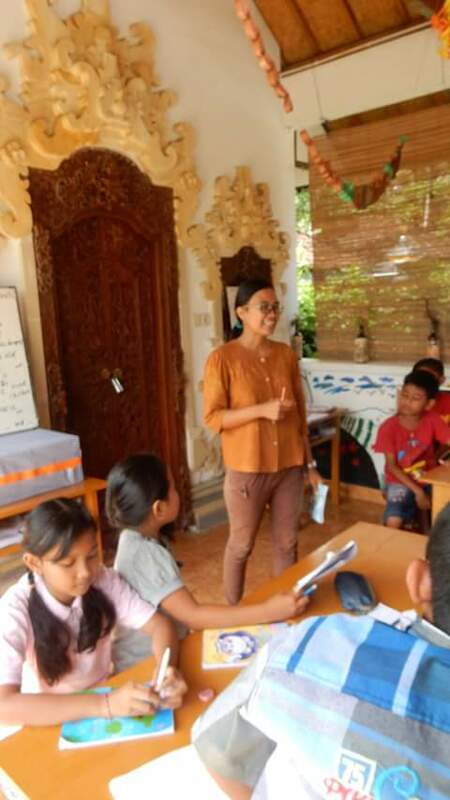 Since 16th of February 2017, I became an English teacher in Eka Chita Pradnyan, in Samsaman. ​It is located in the same Angkah village but different banjar, to reach the school from my house is only about five minutes by motorcycle. The school is built by the WINS foundation from Netherland. the school in Samsaman itsself is managed by an Indonesian, Mrs. Ketut Sunarmi and a Dutch, Oma Trudy van der Maden. The school is for students in grade 4th of elementary school until grade 3rd junior high school. The lesson is given every after-school and also open on Sunday for the senior. 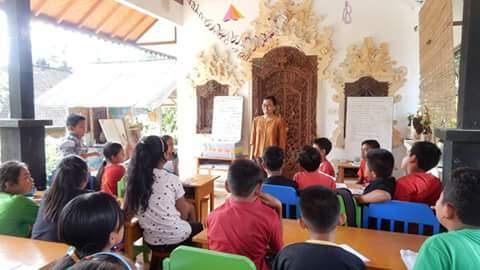 The school only gives English lesson and Balinese dancing lesson. But sometimes when international volunteer comes to the school they give various lesson such as music, creativity, Chi Neng, or yoga. Because of this is after-school so the schedule is at 2-4 pm. Monday, Tuesday, Thursday and Friday are for English lesson. Every Saturday is for Balinese dancing lesson. I teach English only four times a week. Monday and Thursday are for group C and D, the children who are in good level of English. 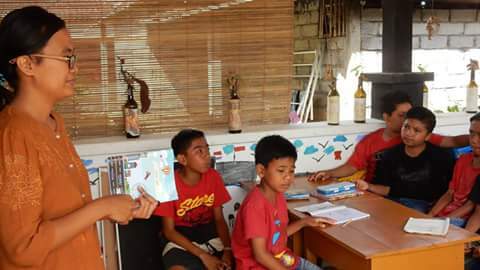 While every Tuesday and Friday are for Group A and B, the children who are still beginners in learning English. When I was teaching in February, there were also two volunteers from Netherland. They are Monique Timmermans and Marijke van Brandenburg. Monique learned Pedagogy in the university and she is still a teacher in Holland, while Marijke is already retired from Hospital as a nurse. When we taught the children together, we splitted the group into two or even three. So we can handle the children well and gave them our lesson. Marijke gave Chi Neng lesson, it was like between yoga and Tai Chi, while Monique gave creativity lesson from recycle material. Monique and Marijke only stayed in Bali for three weeks. And it was fun to join their activity with the children. Next month in May, the school is going to welcome a new volunteer from Finland. There are so many English story books at school. Also there are toys for children such as Uno cards, lego, dolls, puzzles and creativity tools. Sometimes I come to the school on Saturday with Kalki and Kavin so they can play the toys together with my students. Helllo Intam.Thanks for blogging me. I am glad you get your nice job for serious and payed. I see that you like it. and i am sure you make it. Good luck.!! greetings from me .may be we see eachother. Yes, you are always welcome…. Maybe someday when I go to Holland, I can visit you and taste the delicious Dutch cheese! Congrats and good luck for your new job 🙂 I think teacher is a great job. Really appreciate your job, and I’m also happy reading your stories. I remember myself though, I was a teacher before I get a child, but resign after that. Mengajar salah satu pekerjaan yang tak pernah bikin ilmu berkurang. Saya pun selalu kangen kembali mengajar lagi. Semoga bisa via online gitu someday… Enjoy teaching while you can mba!